Do you still have your Christmas decorations up, trying to make the most of the Christmas season? Or do you put everything away on December 26th, ready for a fresh, clean start? We definitely keep our decorations up until January 1 to extend the Christmas season a little at our cozy, little house. If you still have ornaments out and are looking for a great, quick craft to do with your kids, I have one for you…a Rudolph handprint ornament. It will take you more time to gather your supplies for this ornament than it will to complete it, but it’s cute and simple! You’ll need white cardstock, green cardstock (if you wish), brown paint, red paint, and a black marker. Paint your child’s hand with the brown paint and “stamp” it. When the paint dries, add Rudolph’s nose using your child’s pinky fingertip (or the end of a paint brush), add eyes and antlers, and write your child’s name and the year on the side. You can also cut the ornament out and back it with a different color cardstock. Laminate it for durability, add a ribbon hanger, and you’re done! This is Grayson’s Rudolph from two years ago. Rudolph’s legs are a little blurry due to getting wet when our pipe burst last year, but I refuse to throw it away. Memories, right?? Looking back I wish I had used the same hand for the ornaments, so I could have a true progression of Grayson’s growth on the Christmas tree, but there’s always next year! “The bear cubs awake from their deep winter slumber. ‘What can it be?’ they cry, breathless with wonder. Where has the mysterious star come from? What can it be? 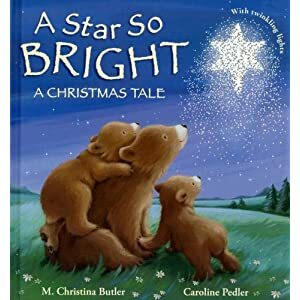 The animals follow the star through the pages of this magical story to find a very special surprise at the end. A sweet, sweet story of a crippled lamb that feels left out. The continual reminder for the lamb (and for all of us) is that “God always has a special place for those who feel left out.” The lamb ends up being present at Jesus’ birth, using his wool to keep the baby warm…being able to be in the exact place in the exact time he was needed only because of his handicap. I’ve included the Amazon links for you, but I’m sure you’ll be able to find these at your local bookstore – I even found The Crippled Lamb half off at a Lifeway book store yesterday!